Following Joanne Chianello (@jchianello) on Twitter is probably one of the best ways to keep in the loop on city council meetings, and Tuesday's Planning and Environment Committee Meeting on Ashcroft Homes' proposed development on the grounds of the former site of the Les Soeurs de la Visitation convent was a perfect example. The meeting will continue Wednesday (and possibly Thursday, as well), and has brought out a huge number of concerns with the site proposal, including those about the nine-story buildings proposed, the number of units (600 in total), traffic concerns with the new residents, and the disruption of a community "linear park" at the south end of the lot (in the image above, it's parallel to Byron Ave., and would be dissected to give the lot access from Byron). After first misreading the proposal, I realized the potentially positive effect of encouraging people to use public transit by offering them a complimentary bus pass (funded by the developer, of course). It would not only offer people a period of time to 'get the hang' of public transit, so to speak, but also may serve to mitigate the traffic concerns with this particular site. The Convent site is a 10-minute walk to Westboro Station, right on the Transitway, which would get riders downtown within only about another 10-15 minutes. Obviously a lot of unfinished business remains in the city's discussions with Ashcroft (a lot of which could be for naught given that Ashcroft has already filed with the Ontario Municipal Board to fast-track the plan), but a partnership between the developer and OC Transpo to offer, for instance, a free bus pass for a year seems like something good for the city, and makes the homes even more attractive for new residents. Unfortunately, unless you can fly the 600m advertised distance to the transitway (if you walk, it is 1km) then your busses will be on the same two streets that this development (and the nearby ones) will swamp with traffic. Maybe in Ashcroft's world the busses can fly too. I think Vancouver (or maybe it's Victoria) BC requires condo developers to give every resident a three year transit pass. This both aclimatizes the resident to using transit, it also reduces the number of car parking spaces required as residents learn they can get about without a car. I have yet to see a street get swamped with traffic. 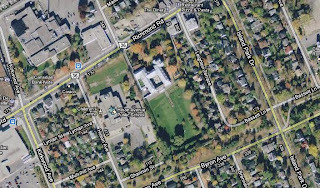 Can anyone point out an example of traffic-swamping anywhere in the built-up former City of Ottawa? Amos, you might want to check out Eric's blog for some interesting LRT route ideas. 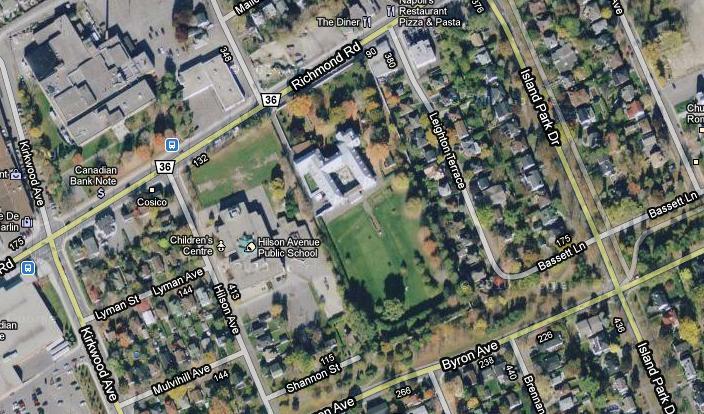 He has one the would put an LRT entrance about 300m from the convent condo.